As soon as we announced our plans for the Wow! Reply, questions started pouring in about exactly how we planned to respond to the mysterious signal received at an Ohio facility 35 years ago. We've received inquiries from around the globe covering every imaginable detail: Where are we directing the signal? How long will it take to get there? And once the reply reaches its destination, how might it be perceived by a possible intelligent alien life form? What if they send another response back? These are all lofty questions - not surprising when you consider the curiosity around the Wow! Reply is rooted in one of mankind's oldest unanswered questions: Are we alone in this universe? The possible athanswers to that question have been imagined in countless ways throughout our history, and driven some incredible achievements in both works of art and science. They are what drive the Chasing UFOs team to investigate sightings throughout the country. They are what has driven many to speculate what, if any, greater meaning the original signal bore. The Wow! Signal may have been nothing more than a fluke. We'll likely never know. But when we started planning a response by crowdsourcing your tweets, we wanted to find a facility that would help us execute this transmission in the most earnest way possible. Unfortunately, the Big Ear telescope that detected the Wow! Signal and pointed in that direction of the sky is no longer in operation. So we went to the best facility available today - Arecibo Observatory in Puerto Rico, the largest single-aperture telescope ever constructed. Where Are We Sending the Wow! Reply? The original Wow! Signal was detected by Jerry R. Ehman on August 15, 1977 with the Big Ear radio telescope at Ohio State University while pointing towards the constellation Sagittarius. When we consider where to send a reply, we should first acknowledge that we’re not precisely sure where in the sky the original signal came from (and to be fair to skeptics, if it even came from space at all). Determining the exact origin of the Wow! Signal was complicated by a few facts. First, the Big Ear used two feed horns to search for signals, each pointed in a slightly different direction. Because of the way the signal was processed data, it’s impossible to know through which of the two horns the signal entered. So while we know the general trajectory of the signal, we can never say with certainty exactly where the signal originated, if it even came from an extraterrestrial source. These details are fairly irrelevant, however, as the Big Ear telescope is no longer in operation, so we don’t have a facility that can recreate the exact circumstances from August 15, 1977. And one must, of course, consider the fact that Erhman and others tried numerous times to recreate those circumstances at Big Ear, and the signal was never again detected. Still, that shouldn’t discourage us from finding other excellent candidates to receive the Wow! Reply. Some astronomers believe that intelligent life in the universe is quite possible, based on the sheer numbers of stars and galaxies. There are 200-400 billion stars in our galaxy alone, and anywhere from 100-200 billion galaxies in the universe (though estimates vary widely). The folks at Arecibo Observatory helped us find some (relatively) close destinations that could harbor conditions similar to our solar systems. We will be sending parts of the Wow! Reply towards three different stars, chosen because of their similarities to our sun: Hipparcos 34511 (150 light years away, and a very close comparison to our sun), Hipparcos 33277 (57 light years away, 1.1 times the size of our sun) and perhaps most interestingly, Hipparcos 43587. That star is reasonably similar to the sun, only 41 light years away and known to have planets, including some thought to reside in a “habitable zone” for life as we know it. How Long Will it Take For the Wow! Reply to Reach its Intended Destination? So if Hipparcos 43587 is 41 light years away, it will take 41 years for the radio waves of the Wow! Reply to reach that star. If someone were to send a signal back to us, it would take another 41 years. That might sound like a long time, but it did take us 35 years just to craft a response, after all. And as Arecibo Observatory scientist Dr. Robert Kerr playfully points out, a spaceship could cross paths with the signal somewhere in between and pick up on the Wow! Reply much sooner!How will we transmit the Wow! Reply, and encode it in a way that might be easiest to understand by a potential extraterrestrial intelligence? We’re going to convert your tweets into binary data, a code of ones and zeros. This form of communication was developed between the 5th and 2nd centuries BC, and serves as the basis for modern computing. You may have seen this code represented on computer screens in movies and TV shows. Next, we’ll take some additional steps to enhance the likelihood of message decoding. Arecibo Observatory will add a “training header,” and a regular, repeating sequence of binary representations to the messages. This helps a receiver recognize that the repeated signal forms are intentional, and likely from an intelligent source, clearly noticeable outside of the random noise generally observed in space. The header will also provide some information that might aid transcription. Of course there’s the hurdle of understanding English and the many other languages these tweets came in. Unfortunately, our technology does not yet allow us to beam foreign language tutors into space, so whomever might discover the Wow! Reply will be on their own from there. After encoding, we’ll transmit the Wow! Reply using Arecibo Observatory’s 1-megawatt (MW) continuous-wave (CW) S-band transmitter, at 2380 MHz (12.6 cm wavelength) to send the tweets to space. This power is roughly 20 times greater than the most powerful commercial radio transmitter, and the 305 square meter antenna surface provides a gain of more than 70db, so that the “effective isotropic power” is more than 10 TeraWatts. The encoded tweets are converted into what’s called a phase modulated wave train by an waveform generator and a “Binary Phase Shift Keying” (BPSK) modulator - this flips the phase of the signal off and on, signifying the zeros and ones we just covered. What are the Chances of an Extraterrestrial Intelligence Receiving, Understanding and Replying Back? After it leaves Arecibo Observatory, the Wow! Reply will take an astonishing journey through space. Because of the amount of time required for a transmission of this size, we’re conserving and adding more power to some portions of the signal than others. Signal strength diminishes overall as distance from Arecibo is greater, so some parts of the signal will be easier to detect at further distances than others. Arecibo Observatory calculates that our signal could be detected at the distance of the our nearest star (Proxima Centuri, 4.2 light years away) by a receiver the size of Arecibo, at a rate of roughly to 100-150 characters per second - essentially one tweet every second, quite a bit slower than most folks’ broadband internet connection. Of course, there may be civilizations with technical signal processing, and noise extraction capabilities, far beyond the current capabilities on Earth. We need to be realistic about the odds of an intelligent life existing, encountering the Wow! Reply, understanding it and reacting to it. The odds are incredible. While the probability of life elsewhere in the universe is widely accepted to be probable, we need to consider all the dominos that would have to fall in place for true contact. We transmit a beacon that would have to pass over a civilization that is technologically advanced and involved in radio science. It would have to pass over the area of their planet possessing at least an Arecibo-sized collector. That receiver would have to be switched on and pointed in our direction during the transmission. which was active and pointed at us – during our transmission. We would then hope whoever is manning that receiver will be listening and recognize our signal as having an intelligent source. Then they’d have to decode it. We have carefully structured on encoding and transmission so that it would be difficult to recognize the signal as anything random. However, decoding the messages is another story altogether. They simply would not have the social context to do that. So, is This a Serious Attempt to Contact Extraterrestrial Intelligence? Make no mistake, the odds are against us. 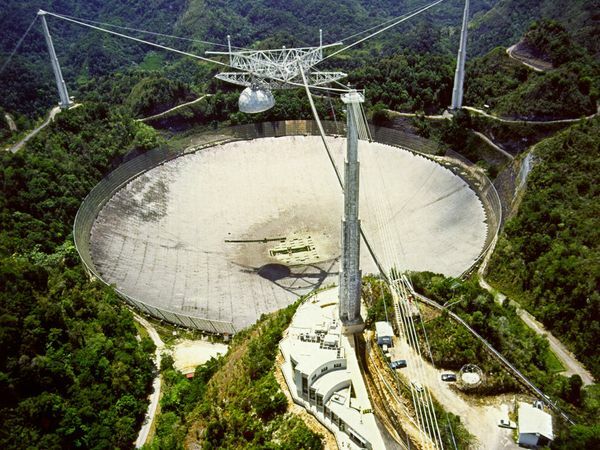 And while we’re working with the team at Arecibo Observatory to provide the most powerful and effective transmission possible, no one involved in this project sees it as a truly scientific step toward finding intelligent life in the universe. After all, this is NOT a SETI (Search for Extra-Terrestrial Intelligence) project. That search is far better performed by listening across many frequencies, and in a very broad spatial domain, then evaluating transient radio emissions for the signature of an intelligent source. Arecibo Observatory says they have been, and remain, proud to participate in that research. But, that doesn’t mean it’s not a fun exercise, designed to provoke a whole range of questions and conversations down here on Earth - what do we believe is our place in the cosmos? If we had to sum up the human experience for another theoretical civilization, what would we say? And, not forgetting the age old question - could there really be intelligent life out there beyond our solar system? National Geographic Channel, the Chasing UFOs team and Arecibo Observatory all believe that any project that provokes a new generation to look up at the stars with wonder and curiosity, and which encourages them to learn about the way the universe works, is a project worth pursuing. Auroras to Aid Planet Hunt? Alien Trees Would Be Black? A pair of videos draws the team south of the border to determine if proof of extraterrestrials is hiding somewhere in Mexico. The most prominent documented UFO sightings. Well that depends who you ask. Here are some theories from various camps. What was the strange 72-second signal from outer space? If aliens were to contact us, how would we respond in a manner that they would understand? © 1996-2012 National Geographic Society. All rights reserved.